The First World War launched a new era in the long history of French-American relations, in part because many American military leaders believed that they were honoring a reciprocal relationship with France. One of the military aides of the American General John J. Pershing, Colonel Charles Stanton, famously proclaimed on July 4, 1917 during a ceremony at Lafayette’s grave: “Lafayette, we are here.” That phrase spread across American and French newspapers, conveying the spirit of an alliance that Pershing and others wanted to reaffirm after the war. The “Insitut Français de Washington” (IFW) was established in this postwar context on December 22, 1926. This date happened to mark the 150th anniversary of Benjamin Franklin’s entry into Paris and the beginning of his successful diplomatic campaign for a French-American alliance during America’s Revolutionary War. The IFW’s goal was to provide a twentieth-century cultural alliance that would go beyond the military and diplomatic alliance of government leaders. James Brown Scott (1866-1943), an expert on international law and an advocate for international peace, was the first President of the IFW. Other key members of the Board of Trustees included Jules A. Baisnée (1879-1970), a French Catholic priest who had served as a chaplain during the First World War and later taught at the Catholic University of America, and Gilbert Chinard (1881-1972), a French literary historian who was then at Johns Hopkins University. General Pershing (1860-1948) became the Institut’s first honorary President. The IFW announced that it sought “to promote in the United States… the study of French civilization, history, literature, and art, and to preserve the memory of French contributors to the development of civilization in northern America by French missionaries and educators, scholars and artists, explorers [and] settlers.” The Institut’s early leaders set out to accomplish this mission by recruiting dues-paying members who could provide funds to support the publication of books on French-American relations and on the history of French visitors to America. By the 1930s, the IFW’s annual Bulletin was reporting that almost 150 people had become either “annual” or “life” members of the Institut; and many IFW supporters were prominent figures in the diplomatic, political and economic life of Washington, New York and other northeastern cities. The Insitut organized well-attended annual meetings at which prominent scholars presented lectures on the history of French-American interactions, affiliated societies sent their own like-minded officers as representatives (“The American Friends of Lafayette” was one key partner), and IFW members gathered for special receptions and banquets. The IFW’s most significant activity, however, focused on the publication of books about the history of French-American relations. Beginning in 1931 and continuing for about a decade, the IFW worked closely with the Johns Hopkins University Press to produce more than twenty scholarly books, including edited volumes of letters or other French-American documents as well as notable reference works and monographs. The recurring themes can be seen in the titles of works such as Nolan J. Bennett, Lafayette in America Day by Day (1934), Howard, C. Rice, Barthélemi Tardiveau, A French Trader in the West (1938), and Louis Gottshalk’s Lady-in-Waiting: The Romance of Lafayette and Aglaé de Hunolstein (1939). Gilbert Chinard served as an intellectual leader for the IFW’s publication projects. He wrote introductions for many of the books and also edited important collections himself. Joining with academic colleagues and with influential friends in the French-American community outside of universities, Chinard helped to build an institutional structure for describing and defending French-American cultural convergences and political values. The IFW’s “golden age” of growing membership and scholarly publications came to an end during the Second World War. Some of the early leaders died and membership plummeted. Chinard had moved from Johns Hopkins to Princeton University in 1936, and the early IFW’s connections with public figures in Washington steadily declined. From his new base in Princeton, however, Chinard continued to recruit high-profile IFW members, including Albert Einstein, John Dewey, John D. Rockefeller, and Maurice de Rothschild. Still a year ago I had some hopes that with new trustees and perhaps a new attitude on the part of the public it would be possible to keep the Institut alive. I do not believe any longer that it is possible to do so…. Both the Johns Hopkins Press and the Princeton Press after handling our publications for some twenty years have refused to continue…. The teaching of the relations between France and American is not part of the curriculum of any school or any university…. In general the people who do research in the field receive very little credit…. There is plenty of vague talk about knowing other countries better, but when it comes to doing the work, to build the bridges… to pass from one country to the other, the builders are too busy constructing their own house. Chinard wrote this gloomy assessment shortly before a meeting of the IFW Board of Trustees in January 1959 at which the members decided to suspend all activities of the IFW and appoint a three-person leadership committee to administer the Institut’s funds until an appropriate plan for fusion with another organization could be developed. But the IFW was not dissolved. Although the recently established Society for French Historical Studies was one of the groups that some Trustees envisioned as a possible partner for merger, there was no consensus on such a fusion in 1959. The new leadership committee included John Meng (1906-1988), who was President of New York’s Hunter College in the 1960s, and Henri Blanchenay, who was a prominent French banker in New York during this same era. The IFW’s earlier leaders, including Chinard, also entered into close communications with the New York-based Cultural Counselor for the French Embassy, Edouard Morot-Sir (1910-1993), who became a steadfast advocate for the IFW’s mission of promoting French-American studies. Even more important, perhaps, the IFW learned that it would eventually receive a significant bequest from Henry C. Morris (1863-1948), a wealthy Chicago lawyer, diplomat and IFW member whose trust funds would pass (after his wife’s death) partly to the IFW. Morris had been a US Consul in Belgium and active at the International Court at the Hague before the First World War; and like many of the early IFW members--including President James Brown Scott—Morris had a strong diplomatic interest in the peaceful resolution of international conflicts. Morris’s expected bequest, in short, offered a financial rationale to keep the IFW alive. Meanwhile, the traditional system of raising funds through membership dues disappeared along with most of the people who had been IFW members. The first payouts from the Morris estate began to flow to the IFW in 1967 ($1,000 per year) and a reconstituted Board of Trustees, led by President John J. Meng, decided to establish a book prize to honor Gilbert Chinard. This prize also led to a new collaboration with the Society for French Historical Studies (SHFS) because the IFW leaders agreed that a faculty committee of the SFHS should choose the annual award recipient and the IFW would pay the award’s stipend from its new income from the Morris estate. The first Chinard book prize was awarded to William Stinchcombe in 1967 for a manuscript that would be published two years later as The American Revolution and the French Alliance. The IFW/SFHS partnership in support of the Chinard book prize would continue for the next fifty years, but it was especially significant, in 1967, as a sign that the moribund IFW was coming back to life. By the late 1960s the Institut was based in New York and Edouard Morot-Sir had become the IFW’s Honorary President. Although Morot-Sir soon left New York and the French diplomatic service to accept American academic appointments in Arizona and then in North Carolina, he remained involved with the IFW from afar. In 1972, when he moved to the University of North Carolina in Chapel Hill, Morot-Sir succeeded Meng as President of the IFW and transferred the Institut’s activities, funds and most of the Board meetings to North Carolina. Soon after the migration to Chapel Hill, the IFW received the long-anticipated bequest from the estate of Henry C. Morris. This generous gift of almost $50,000 assured continuation of the annual Chinard book prize and enabled the IFW to launch new Chinard fellowships for the support of graduate research projects in France. Gilbert Chinard’s dream of a permanent research institute for French-American Studies would never be realized, but his commitment to French-American scholarship was reaffirmed as the IFW began assisting young scholars who would go on to careers in French studies throughout the United States and Canada. The early awards in the 1970s and 1980s were very modest (about $500 for each), but the IFW had found a way to serve its French-American mission in a changing academic and transnational context. Morot-Sir was thus a key figure in the survival and revitalization of the IFW, but by the late 1980s he was searching for new leaders to sustain the Institut’s activities. Drawing on his contacts in Chapel Hill, he recruited two former colleagues in UNC’s Department of Romance Languages to accept the IFW’s key leadership positions. In 1990 Professor Catherine Maley became the President of the IFW and Edward Montgomery became the new Secretary/Treasurer. Maley soon brought a new generation of scholars and supporters onto the Board of Trustees, including UNC historians Lloyd Kramer (who would serve as IFW Secretary from 1994 to 2012) and Jay Smith (who later served as IFW treasurer and as Vice President). Other historians of France and French literature also joined the Board over the following decade: Sarah Maza (Northwestern University), Mary Ann Caws (CUNY Graduate School), Keith Luria (North Carolina State University), Homer Sutton (Davidson College), Barbara Vance (Indiana University), Richard J. Golsan (Texas A & M University) and other talented scholars who supported the goal of strengthening French historical and cultural studies in North America. At the same time, Maley sought new donors to enhance the IFW’s support for research and special projects. Dr. Francis Chinard (1918-2015), the son of Gilbert Chinard and a distinguished medical researcher in New Jersey, served generously as an honorary life member of the IFW Board; and Dominique Arnaud helped to arrange a very significant $25,000 gift from the Pechiney Trading Company. Other gifts came from a growing community of IFW friends and advocates, so that the IFW could launch new fellowships and awards: the Morot-Sir fellowship for literary studies (supported by the Morot-Sir family) and the Harmon Chadbourn Rorison fellowship (supported by a gift from Rorison’s daughter, Mary Ann Caws) were added to the ongoing Chinard research fellowships; and the modest stipends were gradually increased. Meanwhile, the IFW revived an earlier tradition of sponsoring public events on French-American relations and history. 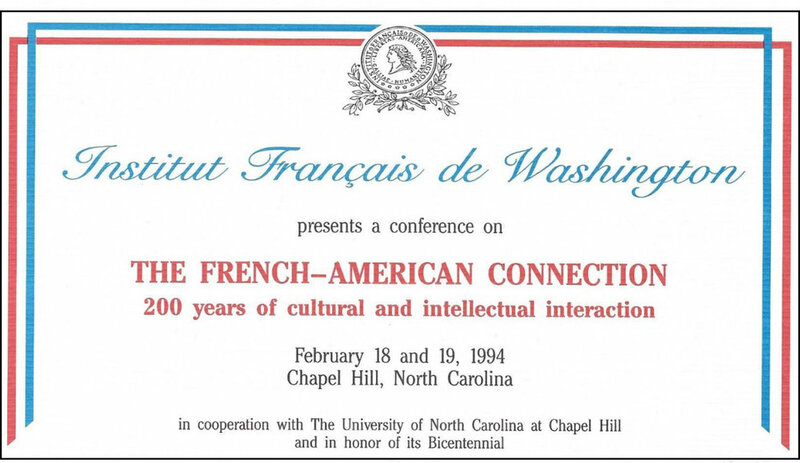 A conference in 1994 on “The French-American Connection: 200 Years of Cultural and Intellectual Interaction,” for example, assembled historians such as Sylvia Neely, Stanley Idzerda, Seymour Drescher, Sarah Maza, and Robert Forester for a lively analysis of notable figures in the history of French-American relations. Other events in the early twenty-first century examined French-American tensions at the time of the Iraq War or the evolution of French politics or contemporary cultural debates in the French media. Modern French-American relations were as important to the IFA as the history of earlier eras. Dozens of young scholars received research awards from the IFW between 1994 and 2016 (a full roster of recipients appears with the IFA’s list of previous research award recipients on the SFHS web site). Applicants for fellowships, however, were understandably confused about the identity of the Institut Français de Washington, which had no link to Washington, operated from a University in North Carolina, and served researchers and teachers in French studies across all of North America. In 2008, the IFW’s Board of Trustees therefore voted to change the historic name to “Institut Français d’Amérique” (IFA). The Institut’s mission and activities continued to promote “the study of French civilization, history, literature, and art” (as the original mission statement had proclaimed), but the new name suggested also an expanding identity as the IFA supported new kinds of transnational projects, research, and public events. Catherine Maley steered the IFA through another transitional era, but in 2012 she decided that it was time to pass the leadership tasks to others. Richard J. Golsan of Texas A&M University, who completed his doctoral studies at UNC, worked with Morot-Sir as well as Maley, and served already on the IFA’s Board of Trustees, was elected as the next (and final) president of the IFA in 2012. The IFA continued to support its well-established research and book awards and to raise new funds from donors who wanted to advance French-American collaborations. It gradually became apparent, however, that it would be difficult to recruit future IFA officers and that the mission of the IFA might be better served by merging with another organization. The Trustees therefore returned to the issue that had preoccupied their predecessors at IFW Board meetings in the late 1950s: should the IFA dissolve itself and (if dissolution was appropriate) how could the Institut’s remaining funds be used to honor the mission that IFW members, donors, and scholars had promoted since 1926? As noted earlier, the trustees of the IFW had considered a possible merger with the nascent Society for French Historical Studies as early as 1959, but the Board decided at that time to maintain a non-active IFW until they could reach a consensus on future projects or find more funds. In 2016, the IFA’s Board of Trustees entered into discussions with the SFHS with the goal of finding new ways to honor the historic mission of the IFA and to use the Insitut’s money for the benefit of future scholars. A Memorandum of Understanding was developed through communications between IFA Board member Lloyd Kramer and the key SFHS officers: Steven Zdatny (Executive Director) and Lynn Sharp (Treasurer); and the SFHS leadership confirmed that the Society’s “Gilbert Chinard Prize Fund” could be merged into a new IFA endowment. On December 3, 2016, the IFA’s Board of Trustees agreed to transfer IFA funds to the SFHS as part of an agreement to fund IFA research fellowships and the Chinard book prize through the ongoing committee structure of the SFHS. The IFA research awards would honor Gilbert Chinard, Herman Chadbourn Rorison, Edouard Morot-Sir and Catherine Maley--all of whom had long supported strong relations between France and America. The agreement for the IFA gift was signed by President Richard J. Golsan for the IFA and Executive Director Steven Zdatny for the SFHS. The IFA’s gift would come to more than $85,000, thanks to the earlier generosity of long-time advocates for French-American friendship such as Henry C. Morris, Mary Ann Caws, and Dominque Arnaud (Pechiney Trading Company) and to the tireless service of IFA leaders such as James Brown Scott, Gilbert Chinard, Jules Basinée, John Meng, Edouard Morot-Sir, and Catherine Maley. The history of the Institut Français d’Amerique (and the Institut Français de Washington) thus came to an end with the final dissolution of the Institut in 2017. Yet the mission it served for more than ninety years remains important both within and outside academic institutions. North American scholarship on France and French-American relations continues to flourish as a lively field of historical study, education, and public debates. The Institut Français will have an ongoing role in French-American intellectual life through the people and scholarly work of the Society for French Historical Studies. Scholarship and cultural exchanges will move constantly in new directions, but the mission of the Institut Français d’Amérique will endure for as long as the analytical study of France and French-American relations remains important in North American universities and transnational exchanges.